The large pine weevil is native to Asia but also found throughout Europe and New Zealand. The major hosts are spruce and pine, though maple, birch, ash, larch and other trees can be infested. The large pine weevil is not yet present in the United States but it has been intercepted numerous times at ports of entry on wood packing material. Potential distribution in the United States would be in areas with highest concentration of pine. 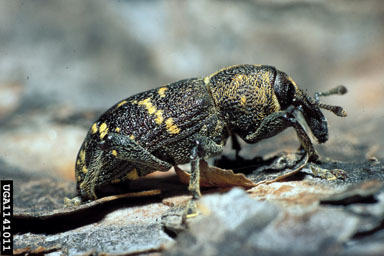 The large pine weevil can live for three years or more. Adults feed at the base and roots of seedlings and in the crown of mature trees, causing dieback of affected branches, stunted tree growth and death. The Hylobius abietis Survey is conducted by the Animal and Health Inspection Service, Plant Protection and Quarantine. A Lindgren funnel with host attractant is placed on or near the host plant from May until September. If suspects are found, they are sent to a regional entomologist for further identification.